If you haven't thrown out those ham bones and turkey carcasses, you're sitting on a gold mine! While the rest of our family fought over leftover meat, I snagged my favorite meat remnant --- the ham bone. 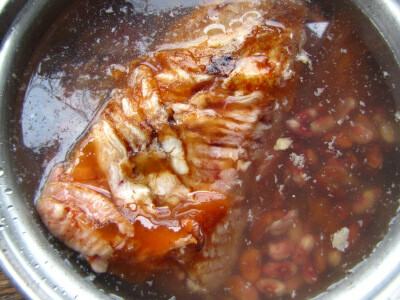 I'll cook the bone up in a pot of beans today, then freeze the result in small segments to turn into refried beans and additions to soups. The final bare bone will go to Lucy as her post-Thanksgiving treat. How about those turkey carcasses? Although I was a bit lax when we lived on storebought birds, raising our own broilers this year has given me a new appreciation for eating every part of the fowl. After picking off all of the meat, I cook the remnants in a big pot of water all afternoon, then pour off the first round of stock to be used as the base of soups. I used to throw out the carcass at this point, but during my summer flurry of putting away garden produce, I needed extra chicken stock for all those harvest bounty soups, and I quickly learned that you can get another batch of rich broth by stewing the bones all over again. Don't forget to throw in a bit of vinegar to tempt more calcium to migrate out of the bones and into the water. After two rounds of simmering, the poultry bones are so soft that they seem to disappear when tossed back to our chickens, boosting the all-important calcium levels of our laying hens and giving them a high protein fix that perks them right up. Perk up your chickens every day with clean water from our homemade chicken waterer.